GreenSeal Solutions concrete sealer formula have been developed using nanotechnology, the smallest atomic structure possible. This results in active particles that are small enough to pass through grains of sand. This small structure translates into a deeper penetration and ensures the ultimate protection for your concrete. Organosilicon compounds have proven preservative hydrophobic substances that are durable. They have excellent water-repellent properties while the concrete continues to breathe. These properties arise from the high resistance to liquids. Once applied, the change of the surface tension will create a surface which is water-repellent and waterproof. GreenSeal Solutions Pro line is designed for homeowners, builders and contractors that are looking for an innovative, environmentally friendly and economical solution. The Pro Line are high performance, waterproofing concrete sealers that also stop attack of organic materials like mildew, algae and fungi. Due to the waterproofing effect, organic material can no longer adhere to the substrate. Our concrete sealer is suitable for both to revitalize and the preservation of concrete. Suitable for applications such as a driveway, basement, garage, patio, kitchen sink or other mineral surfaces. Hydrablock Pro is applied with the aid of an common Household low pressure water spray bottle, brush or paint roller. The unique formula and their long-term protection is backed by an industry-leading 100-year warranty. Algae, moss, fungi The active ingredients close the pores in the concrete. This will make the surface moisture and algae resistant, while maintaining the ability (of concrete) to breathe. 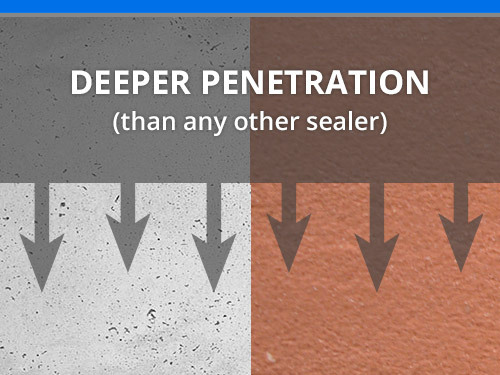 Liquid proof / waterproof Water-repellent impregnating concrete sealer based on siliconate, changes the surface tension of mineral surfaces to create a permanent waterproof and water-repellent surface. It also protects against in water-soluble aggressive salts (such as chlorides and sulfates). Hardwearing Hydrablock Pro Concrete Sealer becomes one with the concrete, is very durable and will only wear off if the concrete surface itself wears. Active, penetrating, industrial # 1 professional and innovative formula. Impregnates and creates a hydrophobic surface. Increased protection due to the hydrophobic barrier. Protects against splashes and flaking by freezing and thawing. Ideal for driveways, sidewalks, roof tiles, concrete blocks, stone and masonry surfaces. GreenSeal Eco-friendly solution Hydrablock Pro is made from natural minerals and is 100% guaranteed environmentally friendly. HydraBlock is applied with a brush, paint roller or low pressure water spray bottle. Developers of innovative, ecological, sustainable waterproofing solutions. GreenSeal Solutions products extend the lifespan of building materials.